It should be noted that the numbers above are based on my own calculations. Rella Holdings investment in Aller is listed on the balance sheet based on historical cost. The Aller Holding B-shares are unlisted, but do trade on some obscure Danish OTC market. There are three sources of value inside Aller. A big amount of cash and securities. 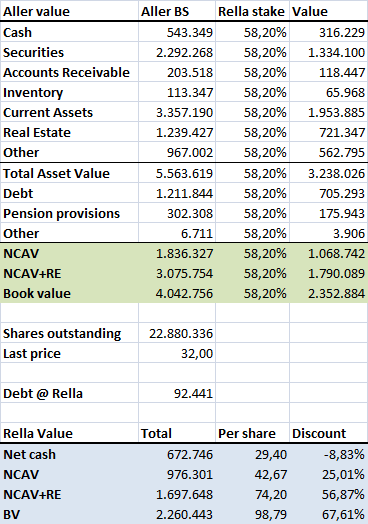 The most meaningful measure of asset value is probably NCAV plus real estate value. Most of the current assets are cash and securities that are marked to market so there is little doubt about the value there. The real estate is the other big item and is mainly an office building that was bought in 2009 for 800M DKK and is located at the Copenhagen waterfront. You never know if it can also be sold again for that amount, but probably for an amount somewhere in that direction, and that’s close enough when you are buying assets at a >50% discount. Looking at a 32DKK share price and 74DKK in tangible assets per share looks like a big upside, but we do need to discount this a bit. Holding companies almost always trade at a discount, and almost always for good reasons because it’s often not a tax efficient structure and there are overhead costs. Administrative expenses are minimal for Rella running at 1.3 million DKK yearly. This is just 0.1% of the current market cap and an even lower percentage if we look at the underlying asset value. So the biggest reason for a discount should be the tax inefficiencies. Aller dividends paid to Rella are taxed at a 15% rate, so a discount between 15% and 20% seems fair based on the expenses and tax inefficiencies. As is visible the company has been profitable four out of the five last years with 2009 being the only negative year. Average EBIT, including results from associated companies, has been 142M a year. While it’s not directly visible from the numbers above the circulation numbers are declining. In 2006 Aller sold 3.3 million magazines weekly while last year it sold 2.7 million, a 20% decline. One thing to realize is that the real estate on the balance sheet is used to generate the above earnings, so if we would simply take the sum of the cash + real estate + operating business we would be double counting a bit. If the company would need to lease an office building the net income would presumably be significantly lower. This source gives a gross rental yield of around 5 percent for Denmark, and with 1.2B in Real Estate on the balance sheet this would imply that the company would need to pay 62M DKK in rent per year. Using the 5 year average number – which isn’t entirely accurate since the balance sheet changed in 2009 with the purchase of the new office building – this would give us an average EBIT of 90M a year. How much cash is excess cash? How to measure earnings? Look at reported earnings or cash flow? What is the right multiple for a declining business? I don’t think there is a single right answer with regards the question “how much cash is excess cash?”. Given the current balance sheet I think it’s obvious that there is excess cash, but how much depends on what you think is a proper capital structure. I think the company could easily run without the 2.3B DKK securities position, and that would imply that it could return 54 DKK in cash per Rella share (ignoring taxes). This would leave the company with 543M DKK in cash and 1,064M total in current assets while total liabilities excluding pension provisions would stand at 1,503M DKK. This is probably a bit on the aggressive side for a company in a declining industry, but the liabilities include 424M DKK in prepayments from subscribers, so it seems to me that it would be a workable capital position. When you have customers that prepay you don’t need a lot of working capital. Maybe it would be a bit more prudent to reserve 300M DKK of the securities to cover the pension provisions, so that would leave the company with 2.0B DKK in excess cash (still 41DKK per Rella share). Long term debt is very low and stands currently at 28.8M DKK. There is a 437M item in the balance sheet titled “Other debt”, but based on the cash flow statement I think those are some sort of spontaneous liabilities, not interest bearing debt. It’s not easy to figure what kind of earnings multiple would be appropriate. How long can the company remain profitable while circulation numbers keep dropping? I don’t know, but magazines aren’t going to disappear overnight and the fact that Rella is a market leader in Scandinavia should be valuable in a declining industry. They should be one of the last companies in business since they can spread fixed costs over the biggest number of subscribers, and when competitors disappear Rella’s decline will slow down. 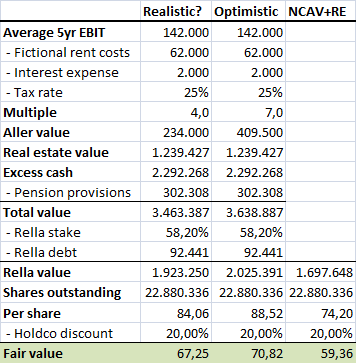 A PE multiple between 7.5 and 8.5x is appropriate for a business that isn’t growing, so that is absolutely an upper bound for the valuation of the company. I honestly don’t know what’s reasonable for Aller. The business doesn’t seem to be declining that fast, so I think that a multiple around 4x or 5x isn’t that bad of a guess. I don’t think being precise is very important, as long as the business does have a positive value I’m already in a good position thanks to the real estate value and excess cash. This would imply that Rella is worth 67DKK per share while the current share price is 32DKK. It also shows that the valuation isn’t very sensitive to the exact value of the operating business: it’s mainly about the assets on the balance sheet. Aller was founded in 1873 by Carl Julius Aller and the company is to this date controlled by the Aller family who own the A-shares (27% of total outstanding shares). Rella Holding owns 69% of the non-voting B-shares. The fact that Aller is fully controlled by the family is probably one of the key reasons the company is cheap: you don’t have to expect a catalyst from a private equity fund or activist investors. I don’t think that’s a problem: value can be it’s own catalyst, and the fact that you are not competing with private equity funds or activist investors might actually be a reason why there is an opportunity in the first place. It does introduce one major risk: the Aller business is probably perceived as a family legacy, and when things go bad it’s easy to see the family throwing good money after bad in order to preserve the legacy. It’s a risk I’m willing to take given the large margin of safety based on the current asset value, and the fact that the family has a large economic interest in Aller as well. 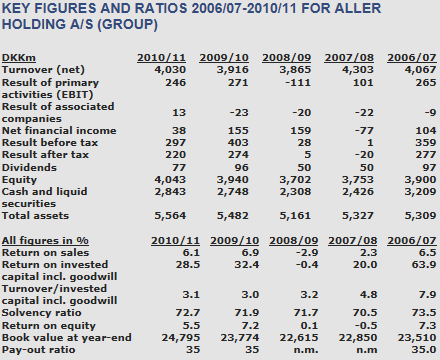 After the poor results in 2009 the company cut costs, and in the current annual report Aller also signals that it is willing to close down or sell non-strategic and/or loss-making activities. Another small positive note is that insiders have bought Rella shares on multiple occasions the last few years, and the last purchase was in March this year when the company was trading at almost the same price as today. Also interesting: not only Rella is buying back it’s own shares: Aller itself also started buying it’s own shares. Apparently some Danish regulation that prevented Aller from doing this before has been lifted. There are a lot of uncertainties with regards to the exact value of Aller and Rella, but one thing is certain: there is a huge amount of asset value, and while magazines and weeklies are perhaps a dying business it is, for now, still a profitable business. This is really the key of the thesis: the easy to value assets are the biggest part of the pie, and the hard to value business isn’t that important as long as the business is not turning into a massive cash drain, and there is no real reason to expect that this is going to happen. With the current discount I think there is a good margin of safety. A lot can go wrong and/or a lot of mistakes can made in the valuation before an investment at current prices will turn in a disaster. The company was written up earlier this year at Oddball Stocks when it was trading at a significantly lower price, so interesting to compare differences in valuation. A more recent write-up can be found on VIC. This entry was posted in Portfolio and tagged RELLA.CO on July 19, 2012 by Alpha Vulture. A minor question regarding this post. Where did you get this information: “Aller dividends paid to Rella are taxed at a 15% rate”? As far as I can see, net dividend from Aller is coming in at Rella. A rough approximation for the latest financial year: Aller dividend for 2011/2012 was 74 mio DKK. Rella owned between 60.5% and 63.8% of shares outstanding and Aller had between 14.42% and 18.81% treasury shares. So dividend to be received should be about 74m DKK * (100% – 16%) * 61% = 38. DKK. Which is pretty close to what they actually received. Unfortunately I don’t have the per share numbers. And I could be mistaken on the treatment of the treasury shares. Rella itself doesn’t pay corporate taxes either due to a ‘tax effect from non-taxable income’. I’m not sure what that is but I guess it has to do with this: http://www.taxindenmark.com/article.37.html . Denmark offers multiple tax incentives to locate holding companies in Denmark. For instances the taxation on incoming dividends remitted by a subsidery to a holding company is very attractive. Where a Danish holding company controls at least 25 % of the shares of an EU subsidiary, for a minimum period of 12 months any dividend from the subsidiary to the holding company is free of withholding taxes. Since Rella only uses cash to buy back shares I think the whole construction is quite tax-efficient, better than owning Aller and paying possible witholding taxes. Finally an interesting observation: if Aller has a bad streak the 35% dividend payout will be smaller and Rella can possibly use less cash to buy back shares at depressed prices. That was a mistake in my original analysis. If Aller has a bad streak the dividend payout could get smaller, but when you look at 2009 you’ll see that they continued paying a dividend even though they recorded losses. So don’t think that risk is very big.